In Georgia, we are close to wrapping up the Works-in-Progress series for this semester, which we have been organizing in collaboration with American Councils. It's been a successful run with a range of different topics and speakers. Here are our stats, thanks to Timothy Blauvelt. Ideally we would like some more Georgians to come forward and present their ongoing research projects in the future. For now, see the program we had below. 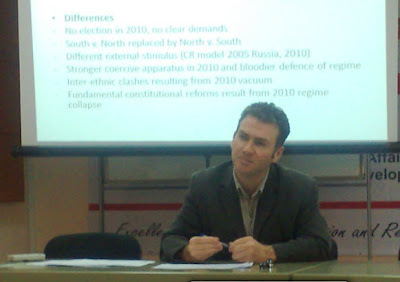 February 9: Koba Turmanidze, CRRC – Assessing the State of Democracy: Citizen Outlook from the South Caucasus. May 11: Paul Crego, US Library of Congress – Strategic Patience: A Way Forward? If you'd like to present, let us know. Otherwise, to hear about the events, follow Works-in-Progress on Facebook.